Before going into detail, there are several terms that need to be understood with regard to shift patterns and the TH400. Buick called this transmission a Super Turbine 400 from 1964-68. In 1964, when the Super Turbine 400 debuted, it was a fixed pitch design. The 64 models also incorporated a unique valve body that only had a Low and Drive range, even though it was a 3 speed transmission. If Low was selected above approximately 30 mph, it would only downshift to 2nd. Below 30 mph, it would go into 1st. 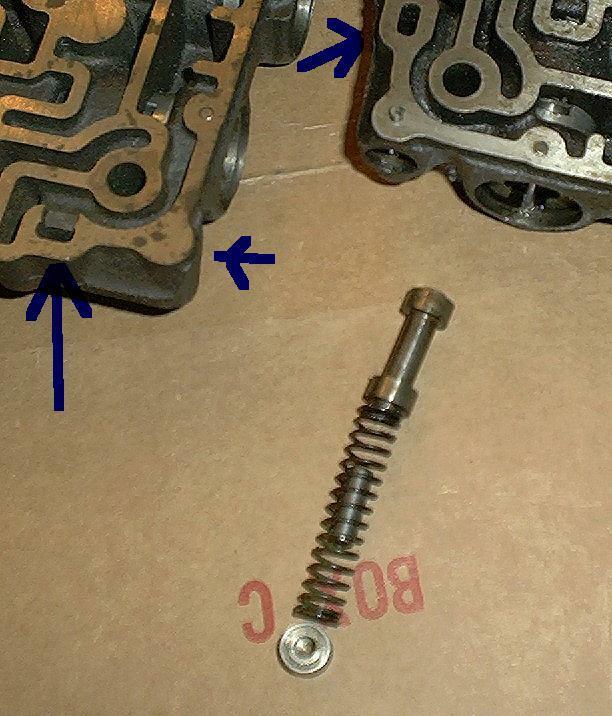 To my knowledge, these early transmissions could not be converted to Switch Pitch and the valve bodies were unique to the one year only transmission case. The switch pitch (SP) was also used between 1965-67 on Oldsmobile and some models of Cadillac as well. However the transmission was referred to as a Turbo Hydramatic 400 by these other divisions. So, the name ST400 and TH400 are synonymous. Beginning in 1969, they were all called Turbo Hydramatic. In order to get an understanding of how the valve body works, there are 3 types of oil pressure in the transmission that change shift points. They are modulator (mod), detent (det) and governor (gov) pressure. Each one will make the transmission shift earlier or later as they change. Acceleration, load and rpm are the factors that alter these pressures. There were several models of transmissions made over the 65-67 period all with different calibrations to set shift points. The main ones that come to mind are BA (67 GS400), BS, BT (some Electra/Wildcat/Riviera), BU (LeSabre) and BW (67 Sportwagon). There are others as well, but these are the most likely ones that are around and in use today in many of our cars. In order to make use of the high stall of the SP converter, Buick set up the shift patterns to stay in higher gear under most circumstances and not downshift into a lower gear until the kick down switch was activated. This is why the switch at the carburetor goes into high stall prior to going into kick down. The valve bodies (VB) in the SP transmissions had different valves than their fixed pitch counterparts. Also, many models either did not have a 3-2 valve or, had the spring removed from the VB to delete the function. The purpose of the 3-2 valve is to not allow a kick down into 2nd until a preset drop in vacuum (which raises MOD pressure) and a reduction in vehicle speed (lowers GOV pressure). When the transmission shifts to 3rd, feed pressure moves the 3-2 valve and cuts off MOD pressure from acting on the 2-3 modulator valve. This allows a degree of throttle opening without the transmission downshifting into 2nd. During harder acceleration, vacuum drops and raises modulator pressure. Modulator pressure and spring pressure move the 3-2 valve against feed pressure and allow MOD oil to act against the 2-3 modulator valve moving the 2-3 shift valve against GOV pressure shifting the transmission to 2nd. With MOD pressure always acting on the 2-3 modulator valve as seen by the VB cutout, one would expect the SP transmission to be able to part throttle to 2nd easily. This is not the case, as the SP uses a smaller diameter 2-3 modulator valve than later VB's. The attached pic shows a VB from a 67 GS400 BA model on the left compared to a 68 and later style VB that has a 3-2 valve. The arrows in the pic show the differences between the VB's and the cutout in one passage that directs MOD oil directly to the 2-3 valve. A part throttle 3-2 downshift is, for the most part, non-existent in an SP trans due to the smaller size of the landing on the 2-3 modulator valve as previously mentioned. The picture below shows the differences in the 2-3 modulator valves between the 67 BA VB on the left and the 68+ style on the right. The measurements of these valves are .477 for the 67 BA and .590 for the 68+. This greatly reduces, if not completely eliminating, the part throttle downshift in the majority of SP transmissions, thereby using only the high stall of the converter for acceleration. Another side effect of this valve setup is the tendency of the SP transmissions to "short shift" into 3rd (sound familiar to any of you?) as this smaller diameter valve landing is also used for DET oil to act upon for kick down. GOV pressure can easily overcome the DET oil and the transmission will upshift at a much earlier rpm. Modifying the governor to shift at a later speed for 2-3 will cause the 1-2 to be much higher than the 2-3 rpm. Again, sound familiar to any of you? Correcting this issue becomes difficult when using a 65-67 SP VB. One option is to use a later 2-3 valve setup in the early VB. However, this may make the transmission part throttle to 2nd too often as there is no 3-2 valve to delay the part throttle kick down. The easiest solution is to find a donor 68+ VB and swap it into the SP trans. Using a later VB also allows using the flat style filter as it has the threaded bolt hole for the filter bolt. All that is needed is the VB bolt, filter tube and 68+ pan. The flat filters are a better design and less expensive than the early tank style. Some flat filters have metal screens that are washable and reusable. Another question that has been asked many times is "why won't my transmission kick down to 1st above 20 mph? While gearing does play a major part in this, the majority of SP transmissions also had 1-2 valves that were designed to not go back to 1st unless the speed was below 20 mph. The 1-2 valves in these transmissions are what I refer to as two stage valves. They have regulator valves and detent valves with a small spring between them. These valves apply against the 1-2 shift valve to keep the transmission in 1st until GOV pressure is high enough to move the shift valve and go into second. MOD pressure is the force that keeps the transmission in 1st. Turning in the modulator raises MOD pressure and will keep the transmission in 1st longer. However, this does not cause the transmission to kick down into1st. Kick down only occurs when the kick down switch at the carburetor is activated. The kick down is done by DET pressure. I won't go into how DET pressure is created, just that it needs to act on the 1-2 detent valve in order to overcome GOV pressure acting on the 1-2 shift valve to down shift the transmission. Like the previous discussion on the 2-3 valve, the size of the landing that DET pressure is applied to has a direct effect on when and what speed the transmission will kick down to 1st. Below is a pic of three 1-2 valve setups. The left one is from a late (76 Olds) VB, middle from a 67 GS400 BA and the right from a 65 Riviera SP. The arrow points to the landing on the detent valve that DET oil reacts against when the kick down switch is activated. 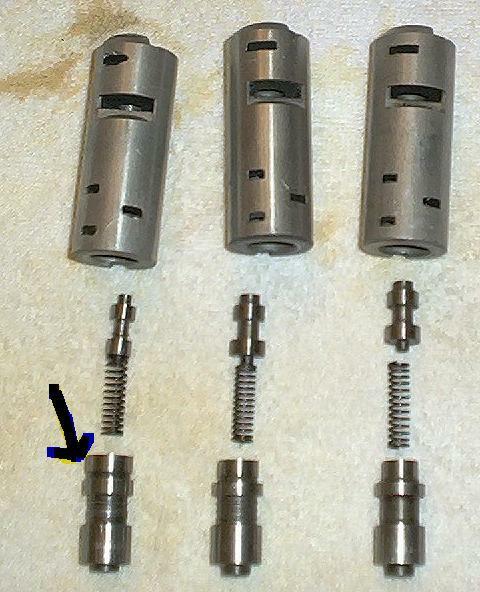 The comparison of these 3 different 1-2 shift valve assemblies clearly illustrates the difference in size of the landing on the 1-2 detent valve that DET oil pressurizes in order to downshift the transmission. The corresponding diameters of the valves are: left .498, middle .438 and right .390 which is the 65 SP valve. There are many different sizes for these valves ranging from less than .390 to as much as .535 I have found over the years. The most common (and works fairly well) is the size valve for the 67 GS400. Many 68+ VB's have this size valve. The larger diameter valves can be found in many muscle car transmissions and occasionally in some full size models. Any size .438 or larger is recommended. When selecting a VB to swap into an SP, the larger the detent valve landing, the better for a higher kick down into1st. Sometimes the detent valves had identification grooves, sometimes they don't. So, measuring is the best way to identify the size of the detent valve landing. .
Interestingly, the 73 Electra/Riviera/Centurion/Estate Wagon model BC transmission has one of the larger ones at around .530 in. Just ask Rick M about his 73 Riviera and how it almost always dropped into 1st when floored. Swapping the valve assemblies between VB's can be done. 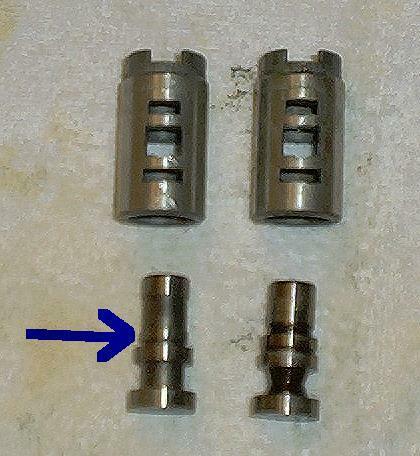 If your SP has the .438 valve and the later VB does not, the aluminum sleeve with valves can be swapped. The 1-2 valve in the VB itself is not always the same size and may not swap, so just use the aluminum sleeve assembly alone. Selecting a good 68+ VB and the modifying the governor will yield better shift points and eliminate the downshifting problems in the SP transmissions. The SP transmission was an innovative design that unfortunately was discontinued due to cost factors and its unfamiliarity by transmission repair shops. Many an SP transmission was converted to fixed pitch by those who thought it unreliable and troublesome. The fact is that setup properly and well maintained, it can provide trouble free service and a significant performance increase. It is one of the many things that make our Buicks unique and exceptional performers.